ChyronHego will have a busy IBC 2018 stand because they will be presenting their latest innovations for live production, sports data, and analysis for both broadcast and streaming social media. Because ChyronHego has plug-ins for most NLE’s, they also support external render engines to create graphics for either the New Media Render Engine or from Camio itself. The company will be showcasing the latest version of LUCI5, their template browser module based on HTML5, that lets producers find the proper graphics template for a given story without having to leave the NRCS (Newsroom Computer System) so the necessary text can be filled out on the fly. LUCI5’s easy-to-understand user interface minimizes the learning curve. 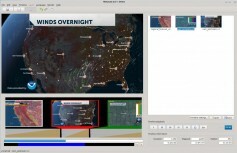 The Metacast 2.6 weather graphics system is fully integrated with the Camio universe, but can also be used as a standalone system. New features include advanced animation for all graphics layers, even the weather model layers, and users will now be able to edit palettes in either in Celsius or Fahrenheit even when the raw values are delivered in the Kelvin scale. 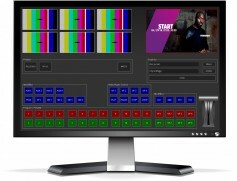 At IBC 2018, visitors will see new playout tools for Metacast 2.6 that support keyboard commands for queuing and taking graphics to air. Metacst 2.6 features simplified application setup. For sports broadcasts, visitors will see updates to the Virtual Placement system which now supports 4K recording and playout with enhanced real-time data integration with the company’s recognized sports tracking systems, TRACAB and ZXY as well as third party real time data sources. Virtual Placement now includes enhancements in motion blur to its tracking capability, something that is especially crucial when following the action in horse racing with the infield fence whizzing by the camera. Augmented Reality (AR) will also be a major component of the ChyronHego exhibit with both Plutonium and Neon virtual studio and robotic camera systems on display. Version 5 of Plutonium is a virtual set tracking system, while Neon version 4 is an all-in-one trackless virtual set. A new HTML5-based control panel for both systems, based on the company’s Live Assist Panels platform, will be demonstrated as well as new integrations of the software with industry-leading gaming engines such as Unreal from Epic Games. But I wanted Ung to explain the difference between the tracked and trackless studio robotic applications. The newest version of the Live Assist Panels user interface and control panel creation tool will demonstrate how the latest multi-user Web technologies can be leveraged to create custom-designed GUI’s for touch screen control of any ChyronHego product. Live Assist Panels enable a more efficient workflow. ChyronHego introduced Click Effects Prime last year, and will reveal a new version 3.2 for arena and stadium-based A/V presentations. A new release of Lyric 3.4 will be shown. Leveraging 64-bit architecture, LyricX now offers advanced 3D object rendering and support for Avid’s DNxHD and ChyronHego’s internal compression technology, GTC. Visitors to the stand will also seethe latest version of ChyronHego’s universal graphic platform, Prime Graphics 3.1. Prime Graphics 3.1 accomplishes five mission-critical applications within a single 4K and IP-ready playout platform: a character generator, a clip player, a video wall system, a graphic’s-driven touchscreen platform and an on-screen branding system. The platform is IP-ready and supports SMPTE ST 2110 and 10-bit HDR color allowing it to deliver the client’s choice of HLG or S-Log3 formats. Among its other new capabilities are support for ChyronHego's new Intellicommader Keyboard for Lyric, with a new fast recall feature, a true HDR canvas, and a new concept called base scene workflow.